The early Christians relied on cutting edge technology as they compiled and disseminated the texts of the New Testament to the churches and Christians of the earliest centuries. The Apostle Paul would send letters with emissaries to respond to issues that had been raised by the Christians in Corinth or Thessalonica. Paul’s letters were versions of the common Greco-Roman letter, expanded and “Christianized” through language and content to reflect the needs of the first churches. In a similar way, Christians jumped on the new technology of the codex instead of the more common scroll, influencing the wider culture in this regard. Today, Christians are engaging with Scripture on the internet and beginning to explore the possibilities for reading and praying with the Bible online. The World Wide Web presents an unparalleled opportunity to bring the word of God to anyone anywhere in the world. Access to online resources brings the hopes of “Dei Verbum” ever closer to fulfillment that “easy access to Sacred Scripture should be provided for all the Christian faithful” (No. 22) and that “prayer should accompany the reading of Sacred Scripture, so that God and man may talk together; for ‘we speak to Him when we pray; we hear Him when we read the divine saying’” (No. 25). In reading the Bible online we become a part of the ancient church’s practice through this new technology. The Internet can be likened to a cacophony of competing voices, loud, overwhelming and tumultuous, much like the Areopagus in Athens, where philosophers and teachers brought their teachings beneath the Parthenon. Yet, it was precisely this cacophony to which the Apostle Paul brought the Gospel according to Acts 17:16-34 and his message was received in a number of different ways, including rejection. The Web is the new Areopagus, a place where every opinion is offered and considered. Antonio Spadaro, S.J., in Cybergrace, also argues that it creates a translocal meeting place, a “geolocalized” space where we can create a network community for prayer and study. The Internet allows for both “interiority” and “interactivity,” a place to reflect, pray and study the Bible, while at the same time reaching across space to create community with someone thousands of miles away. This means that the Web itself is also a spiritual place—it evokes in some ways the reality of the Holy Spirit, since it consists of millions of unseen points of connectivity, invisible but present, creating genuine connections among people. In reading the Bible online, these connections need to be fostered by four things: openness; accessibility; caution; and engagement. As one wades into the Areopagus, the egalitarianism of online Bible discussion can be frightening, but it is also creates numerous places where marginalized voices can be heard and communities formed where otherwise these voices might be isolated. The Internet places an individual’s encounter and experience with the biblical text at the center of interpretation not at the margins. “Dei Verbum” asked that the word of God be made available to all the faithful and the Internet has achieved that goal in a way the church fathers could not have imagined. 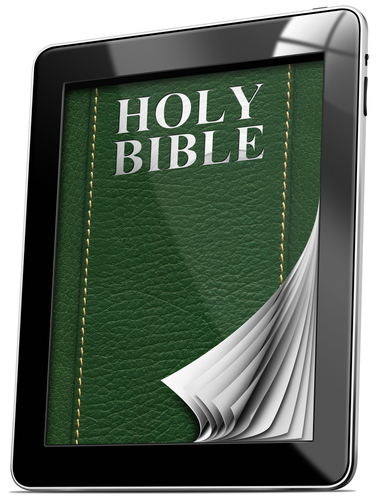 The Bible is now available to everyone with access to a computer or smartphone. But caution is also needed in the online Areopagus, due to the danger which comes in the shape, usually, of people giving you the one verse, the one secret, the one clue, the one interpretation that opens up the whole of the Bible. If you want to read something on Catholic biblical interpretation, why not go to the Catholic website par excellence, Vatican.va, to find out what the church has said about it? Sites such as Felix Just, S.J.’s site on Catholic Resources for Bible, Liturgy, Art and Theology, or the St. Paul Biblical Center for Biblical Theology, also offer material which is variously academic or devotional, but solid and trustworthy. Engagement is also essential for a community of readers and students of the Bible online. I do not mean this simply with respect to the style of writing necessary to capture people’s attention, though this ought to be a part of it, but a good biblical Web site ought to offer the ability to discuss and study with an online community that is most concerned to deepen knowledge of the biblical text and not prove one’s superiority of knowledge or trumpet one’s expertise. This does not mean one should not be challenged online, but respect for the Bible must remain the paramount concern of all engaged in its study. The first place to start is with a reputable Bible. The American Bible Society Web site has literally hundreds of versions (582) and languages (466) available. Since most people reading this will be reading the Bible in English, it is important to locate a good English translation. For Catholics in the United States the version read in Mass is the New American Bible, which is available online at the web site of the U.S. Conference of Catholic Bishops, where it can be found in the daily readings and chapter by chapter according to each biblical book. The American Bible Society web site also has the New American Bible Revised Edition available now in searchable format, as well as the New Revised Standard Version, the most recommended translation by academics and recognized by the Catholic Church. In fact, a list of approved English translations of the Bible is available on the USCCB web site. A number of excellent resources are available at the Living Word page of America, including links to the ABS web site. America also provides a number of different resources for study of the Bible such as podcasts, daily reflections and the Faith columns among other study and prayer tools. The USCCB also offers daily reflections and audio readings of the daily scriptures. One can also find the entire Bible on audio at Bible Gateway, where it is available in a number of languages and versions. The English versions, however, do not include the NAB or the NRSV. There are also numerous Bible blogs, including The Good Word at America, where my fellow contributors and I present the Scripture from numerous angles and approaches, some academic, some more popular. Some blogs basically try to replicate the academic world and its arguments online, others try to bring academic knowledge to the Web in a more down to earth fashion and some offer basic information. One of the best things about the Web has been the number of young scholars or graduate students, especially women, who have found a community and voice online. You can now hear the voices of female African-American biblical interpreters or young Catholic academics discuss the Bible, even if you are literally half the world away. Voices that previously were isolated can now be shared across geographical, ideological and ecclesial boundaries. Twitter is a terrific way to connect with numerous Bible blogs and Bible professors, not to mention the pope himself, simply by following them. My Twitter feed is constantly being replenished by new information about the Bible and what people have to say about it. It creates an amazing intentional community when priests, lay people, evangelicals, nuns, Lutherans and Baptists tweet out Bible verses or meditations or ask for prayer. You can also join online communities to pray with the Scripture, such as the online retreat offered by Fr. James Martin. Study of the Bible itself is a form of prayer which ought not to be overlooked. Anyone who has been online has gone into a “rabbit hole,” where one link takes them to another and then to another. It can seem like wasting time. I want to suggest that when one becomes absorbed in reading the Bible online and seeking out answers, the biblical “rabbit hole” can become a form of prayer itself. For me the combination of connection, silence and content that the Web offers is conducive to prayer and prayerful reading of the Bible. Another way to connect to the Bible is to listen to podcasts, either on particular topics on the Bible, or lectures on technical aspects of the Bible, or discussions with Bible professors. The University of Nottingham Department of Theology and Religious Studies has a number of short videos, called “Why Study…” videos, such as “Why Study Romans?” or “Why Study Biblical Warfare?” The same department has also produced the Bibledex, which includes a short video on every book of the Bible, including the Deutero-Canonical books. The Bible online also offers an ecumenical hang-out. I spend more time with Christians of all sorts on my Twitter feed, on my blog and on my Facebook page than I ever have before. The Bible is too often a place of internecine fighting amongst Christians when it should be a source of unity. We need to make the Apostle Paul’s exhortation our own: “Let your gentleness be known to everyone” (Phil 4:5). This attitude reflects a way of being which we can bring to the online Areopagus that models Jesus’ prayer “that they may all be one” (John 17:21). This desire to create friendships and community with fellow Christians online motivates careful biblical reading and biblical study, even where essential disagreements exist. The other conversation partners one meets online are people of other faiths and no faith, including atheists. Since one never knows what sort of encounters people have had with Scripture before, it is important to create a safe space to discuss the Bible. It is in these discussions where I have felt most fully the need for prayer in terms of my answers, my attitude and my understanding; it is also the time that I have felt most like the Apostle Paul on the Areopagus. Catholic Resources for Bible, Liturgy, Art and Theology, offers numerous academically trustworthy resources for the study of every book in the Bible, but also for those seeking devotional content and depth. The St. Paul Biblical Center for Biblical Theology, audio and other resources are available here for the study of the Bible from a Roman Catholic perspective. The Bible Gateway Blogger Grid, a collection of numerous bloggers on Scripture from a variety of perspectives; check some out and see who appeals to you. USCCB, the American Bishops offer not just the Bible itself in the NAB translation, but audio and video reflections on the daily readings. NT Pod, Duke University professor Mark Goodacre podcasts on various aspects of the history and academic study of the New Testament and is eminently clear. He has numerous other resources for study on his website and blog. Bibledex, a website from the University of Nottingham Department of Theology and Religious Studies featuring videos on every biblical book and numerous other videos too on particular verses and theological questions. @NyashaJunior, Bible professor at Howard University, partly love to follow because her blog is called @NoExtraCredit, but even more because the blog is creative and fun. @MichaelPeppard, Bible professor at Fordham University with tweets that combine interests in current events and biblical studies. @LHSchiffman, very active on Twitter, this Yeshiva University scholar will keep you up to date on all Dead Sea Scroll news and the study of ancient Judaism. @bbibb, Hebrew Bible professor at Furman University, knowledgeable about the use of new technology and social media for teaching. @KristaNDalton, PhD student at Columbia University, she represents a number of younger scholars finding their voices in the new media in a way that many older scholars have yet to do. You will notice that she and many other younger scholars, such as @DyingSparrows and @JanellePeters , have a lot more followers on social media than more established scholars, either because they are more fun or more in tune with new media. Professor Martens, I believe I mentioned once or twice before that, “Skepticism doesn’t sell Bibles.” I can assure you that this principle is equally true for electronic and paper formats. To put it another way: approaches and studies of the Bible that begin by making a series of skeptical assumptions about the scripture cause people to loose interest in the topic when the assumptions become apparent to the students. The same principle applies whether the message is communicated by print, word of mouth, cyberspace, flash drive or carrier pigeon. From our pervious discussions I sense that you might not believe me. If you don’t believe me, then believe the admissions that professor William L. Burton made in his article, “Buried Treasure,” in Commonweal magazine (April 6, 2007). Burton said: “For many years I taught biblical studies at Catholic universities. I discovered that there was less and less familiarity with the Bible in each incoming class.” Perhaps you may have noticed a similar phenomenon among your own students. Not only are incoming students less interested in the Bible, the outgoing students are as well. Professor Burton added that: “Many students are exposed to first-rate biblical scholarship in spite of poor preparation. The problem is that too few of them maintain their interest in Bible studies once they graduate.” The professor is actually admitting that when you teach young people “first-rate” critical scholarship on the Bible, they loose interest in it. If people won’t read the NAB or NRSV in print, why would they study them online? Just some friendly advice. Mention was made here of the Bible Gateway web site which I frequently use. I refer to this for the use of the word "Gateway" which leads into what I believe is the sentiment of your post. "Gateway" is also used in reference to drug use or abuse. Marijuana is often called a "gateway" drug that may lead people to use other drugs. I believe I have recently experienced what Edward is saying here. Next week, at my parish, in our adult faith formation program, I will start a Bible study for 10 weeks with the Little Rock Scripture study of the Acts of the Apostles. When I phoned up the parish office to sign up/register for the class, the administrator of the class instructed me as to the logistics of the class and requested that I bring "a good Catholic translation of the Bible" and not a "King James Version" of the Bible. I own 4 or 5 different translations including a Douay Rheims, NAB and others. I did not comment to the administrator over the phone but was somewhat put off by the denigration of the King James Version. When one starts studying ANY Bible, any translation, they stand (or sit) at the GATEWAY no matter what version they start with. I think of many poor people who reside in the area and neighborhoods surrounding my parish. Welfare recipients are often housed by state agencies temporarily or for some extended period in local motels and these motels contain that standard Gideon KJV Bible in every room. I think of people who may only have access to that translation of the Bible. I do not believe any catechist should make any blanket statements regarding the superiority or inferiority of one translation over another unless they are quite familiar with the individual student with whom they are working and their level of advancement and evolution in their lectio divina and Scripture study. I saw Scott Hahn on a call in program on EWTN answer a question from a person calling into the show. The caller asked Dr. Hahn which translation he used and without skipping a beat, Professor Hahn answered:. "RSVCE Revised Standard Version Catholic Edition". OK fine. That is not one of the translations that I currently own yet I can still visit St. Paul Theological web site, with the versions that I have on hand and access the RSVCE on line. My wife attended a Christian college and I asked her what translation they used. She reacted to our discussion in much the way you described Edward. She exited her college all that not interested in continuing her study exactly because of the scenario you describe in your post. Professor Martens, It is after 1:00 AM Sunday morning and I am still sitting here watching the Bibledex videos. I blame this on you. Alright I'll take the blame! John W. Martens is an associate professor of theology at the University of St. Thomas, St. Paul, Minn, where he teaches early Christianity and Judaism. He blogs on the Bible at "The Good Word" and "Bible Junkies" and tweets @BibleJunkies. This article is part of America’s new series, “The Living Word: Scripture in the Life of the Church,” co-sponsored by the American Bible Society.